The DTIF consists of three main dimensions, which are illustrated in Figure 1 and explained below it. The DTIF is fundamentally the same as the ICT Innovation Framework (ICTIF) that was used by the NP3 Project - the only differences being the labels used in the Quantity dimension. 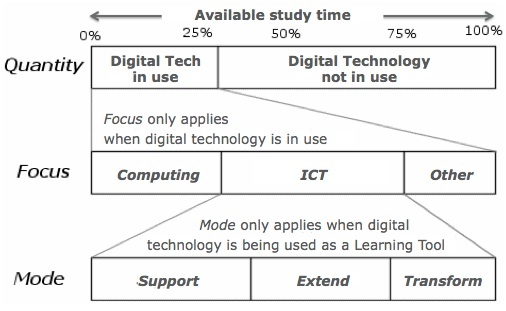 Quantity relates to the proportion of available study time that digital technology isbeing used by the learner. This underpins the other two dimensions. 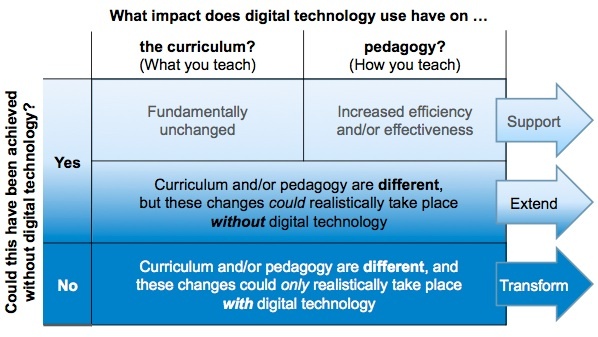 The Focus categorises the objectives underlying the use of digital technology. As illustrated in Figure 1, if digital technology is not in use then the Focus dimension does not apply. This page was last modified on 20 June 2017, at 15:46.